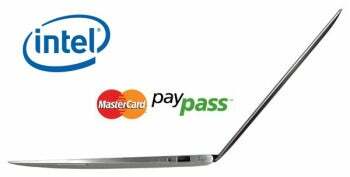 Intel and MasterCard have joined forces to bring mobile payments to laptops--specifically, in next year's batch of super thin, light ultrabooks. The built-in Near Field Communications (NFC) technology will let you tap your laptop with your smartphone or credit card to make online purchases. Intel and MasterCard are working on building security verification into the laptops and incorporating MasterCard's PayPass technology, which is currently in use with credit cards, key phones, and smartphones. Google Wallet's "tap-and-pay" system for mobile phones leverages the same technology: you tap your smartphone to a PayPass reader to pay for in-store purchases (rather than digging out your credit card). This time, ultrabooks will be used as a sort of PayPass reader. Not only will this make online purchases more convenient (just waving your smartphone or credit card at your laptop, instead of typing in the entire 16-digit number), but it will also make purchases more secure. Credit card info will no longer need to be stored in online stores' databases to ensure a quick, streamlined checkout. Intel's "Identity Protection Technology" (IPT) brings two-factor authentication (an extra level of security) to the ultrabooks as part of this mobile payment feature. IPT distinguishes that laptop from every other one by associating your PC with a unique token. Since the tap-your-phone-to-pay experience is still a novelty, it may take time for the tap-you-laptop-to-pay to take hold. But, needed or not, it's coming soon to a laptop near you!